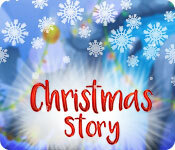 Christmas Story is rated 2.9 out of 5 by 8. Rated 5 out of 5 by raydog from Sometimes you just want to have some fun with a game! I have played versions of this game but so what? I am really enjoying this game. Playing it now for the second day and I love the graphics, the characters and even that silly song that keeps playing. I love match 3s and this one has some unique power ups. I also like that the board keeps switching around so when you think you have lined up the best ever gang of match 3s ever - it switches. As for the storyline - I put excellent because at least the characters are not telling me what to do each new level. Rated 4 out of 5 by maxbridge from Lighthearted Fun - Nice graphics - A good relaxing game Don't overlook this game if you like Match 3 - as it does get a LOT harder later on. 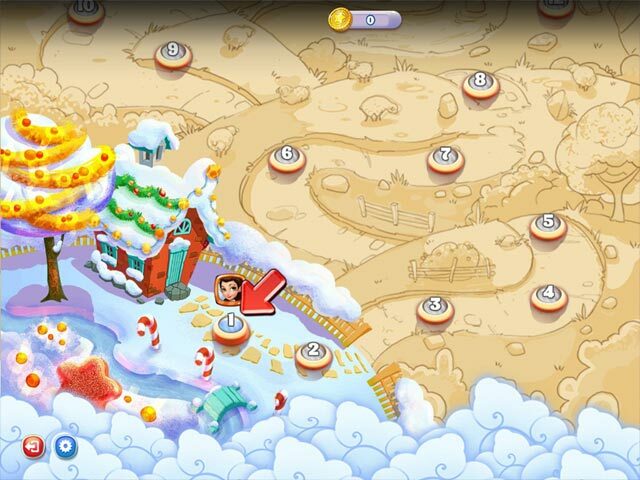 Initially the graphics make it seem pretty childish, but it does get tougher as you work out a strategy to finish. Once I worked out how the star system worked I got into the rhythm of the game and am thoroughly enjoying it . I have bought it as a relaxing fun game to play when I need a break from more stressful or darker games. I recommend it - give it a try for the first free hour - I was surprised how quickly that passed and I wanted to carry on so I bought it.. Rated 4 out of 5 by compcrzy from I like it I will admit this game is simplistic, but it's fun. I enjoy games that are repetitive. I don't need extra bells and whistles. I purchased the game before the demo finished. Rated 3 out of 5 by Luvago from Colourful Match 3 Did demo in relaxed & tried to swap over to normal, but no success. Later commenced with a different name in normal mode. Normal didn't seem much if any different & apart from 2 levels I sailed through, as the bonuses seemed to do their own thing, with lots of explosions etc. These do help to keep you awake. The goals were fairly easy to achieve, @ least for some time. You are given coins for no. of moves unused, which can be used later for when you run out of moves or need more boosters. There are goals & hints given @ start of each new level - seemed to be 15 levels in a chapter of the story - could not bear the Reindeer in the story part & hurried on. The graphics are simple, but the sweets are pretty & I barely noticed the music. I did buy on special offer, if only to try the normal mode. Rated 2 out of 5 by BibiBuggs from Grumpy Producing This is where I'm grateful for BF's trials. I wanted to like this. In fact, I enjoy match 3 games but not this one. This was a different type of Match 3 that I found to be frustrating. Immediately upon starting, the first thing that I did was mute the sound. Annoying. That said, I believe the music and/or sound was intentional -- to help create a sense of 'agitation' to add 'excitement' but it had the opposite effect on me. Instead, I found myself feeling more and more grumpy. No fun in that. Essentially, it was high pressure repetition -- a different kind of match 3 that I did not do well under. There was a redeeming factor to it even though I wouldn't buy it -- it could help improve a person's manual dexterity (under pressure). In that case, not a bad way to improve dexterity. Rated 2 out of 5 by Limey2 from Why bother Nope. No challenge. Boring. One of the worst of it's kind I think I have ever played. I actually managed to play the demo for a whole 12 minutes before I had enough and just couldn't manage another second. I will definitely NOT be playing this game ever again. Rated 2 out of 5 by pennmom36 from SUGAR COATED MATCH 3 GAME Another sugar coated Match 3 game by the same devs who offer Pretty Snails 1 & 2, Owl Rescue, Flying Fish and Mystery Loss. Everything's the same, with the exception of finding items hidden within the map levels. You can play in Relaxed or Normal difficulty modes, and this is a Limited Moves game with different goals for each level such as making matches over all ice tiles or earning a specific amount of points. All Match 3 games by this dev have the same unusual feature, every time you make a match, sections of the board do a shuffle as they move into different positions, usually ruining what could have been an epic setup! On the negative end, you cannot make a move quickly or back to back until all tiles have repositioned or explosions finish doing their thing. 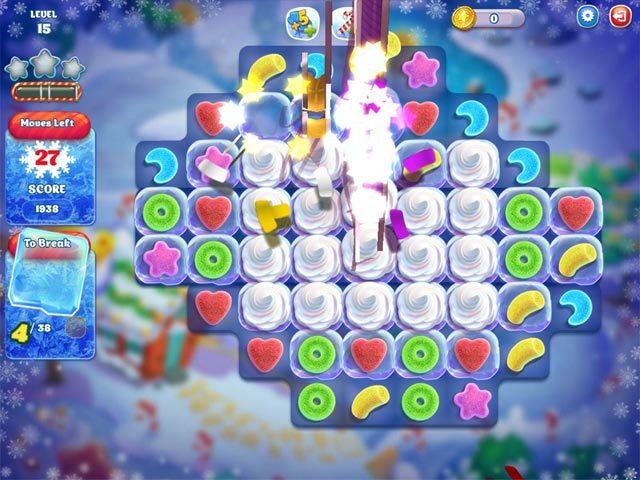 Large matches or T & L shaped matches will give you power-ups on the board which are color specific such as Spiral Candies, Colored Santas, or Super Spirals. Combining power-ups will create mega explosions. I hate Match 3 games that make me wait after each match, for all the tiles to stop, before making my next match. I also hate it when I have to wait again after the level is complete, for all the tiles to finish doing their explosions, and adding my unused moves. I prefer a fast paced Match 3 game. I'm sure you'll love this game if you loved Pretty Snails, but for me personally, it's a big NO! Rated 1 out of 5 by Kaylos from And The Point Is? Could be a beginner's child game No goal - no purpose - just a total waste of time waiting for something to happen and never does!